Every year, May is considered to be National Bike Month and in the spirit of cyclists and bike enthusiasts everywhere, the folks at the League of American Bicyclists want to raise awareness of cyclists on the road. It is also a great time to invite everyone to try biking to work, church, the store or maybe just biking around the neighborhood for the sake of enjoyment. Biking to work or even just to run errands can help you stay in shape as well as save you money. After all, the more you ride your bike instead of drive your vehicle, you can spend less money on gas as well as reduce wear and tear on your vehicle. Needless to say, biking to work can save you money, improve your health and even help the environment by reducing carbon emissions. Yet cyclists have been raising awareness of drivers to “share the road” to improve bike visibility to drivers and thereby reduce accidents. For instance, when drivers stop for stop signs when turning right, they must also remember to be aware of cyclists and look to the right and back to be aware of bicyclists. Is a Stop Sign a Yield Sign to a Cyclist? The same as motorists, those who ride bikes must also be equally aware of the traffic signs and road signs since they apply to them as well. Some cities such as Los Angeles and other major cities, have been making the argument that a stop sign is more like a yield sign to someone on a bike and thus should be treated as so. (Some states such as Idaho allow this.) Though some cyclists may not agree with the current laws, they must heed to stop signs and road traffic signs in the same manner that cars do. 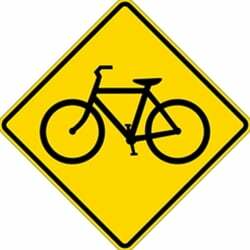 So if it has been awhile since you’ve biked around town, at least for the time being, you should remember to treat all the road safety signs including stop signs and yield signs the same as you would as if you were driving. In the state of California and in most states minus Idaho, those riding bikes are required by law to do so.